Designing a new kitchen for your home? 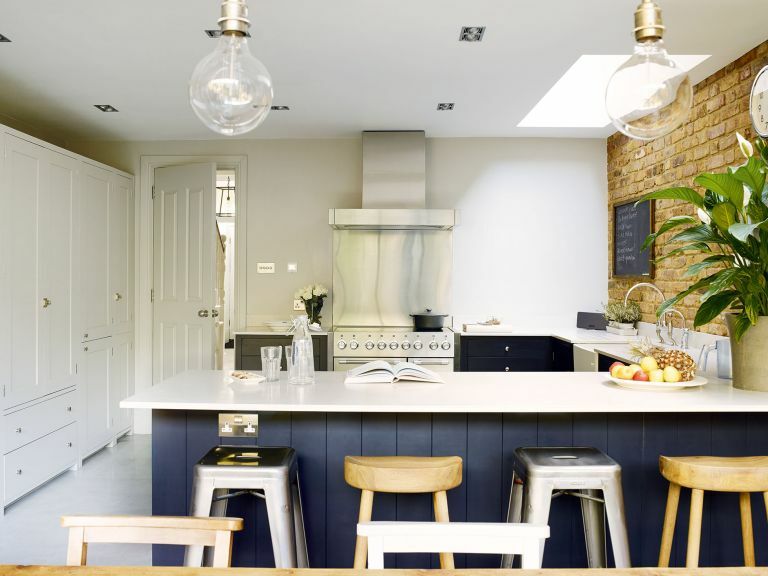 Be inspired by this kitchen extension, which allowed the owners to create a beautiful kitchen diner with bags of built-in storage and a utility room – and check out all our room transformations for more clever ideas. In 2013, Jo and Gary Durden decided to entirely remodel the ground floor of their west London home. 'Our boys were constantly coming home with muddy rugby kits, and we desperately needed a utility room, so we took the decision to block off the narrow end of the living room to create a utility space and a larger cloakroom,’ she explains. The contractor was able to start on the neighbours’ extension first, while Jo and Gary finalised their plans. Their previous kitchen, installed soon after they bought the property, had been a glossy white design, but this time Jo wanted to source simple Shaker units that she could team with industrial features for a contemporary edge. A pared-back Suffolk design by Neptune provided the look she was after. The couple’s old kitchen was a U-shape, and Nicola proposed a similar layout, but making use of the new, wider dimensions, ensuring an unobstructed passage from the doorway through to the garden, while one end forms a sociable breakfast bar, dividing the kitchen and dining space. The bank of cupboards is the same warm grey as the walls, while the other units, in a smart dark navy, provide contrast. The polished concrete floor, with underfloor heating, adds to the palette of subtle greys – its smooth surface proving popular with the couple’s sons for skateboard practice.